When I was a little girl, we had a family friend who was an avid birder. She taught me early on that birding was a great excuse for taking a walk in nature. Today, I can watch any nature show that comes on the television and my favorite segment in television is the “Moment of Nature” on “Sunday Morning on CBS.” I am also a confessed bird nerd, so when I won a trip to Grand Island, Nebraska, to see the sandhill crane migration I was elated. The trip included morning and evening viewing of cranes as a VIP at the Crane Trust. 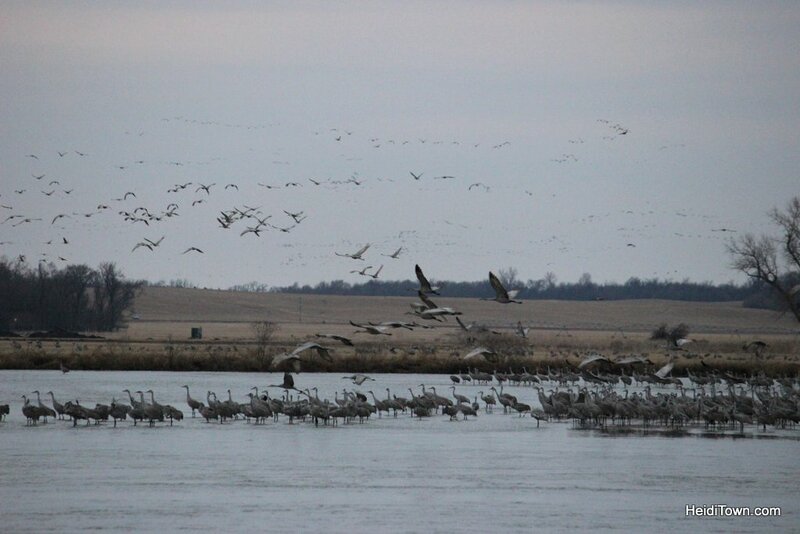 The migration of cranes through Nebraska is one of the largest migrations of any species in the world and witnessing this phenomenon is on the bucket list of most birders. 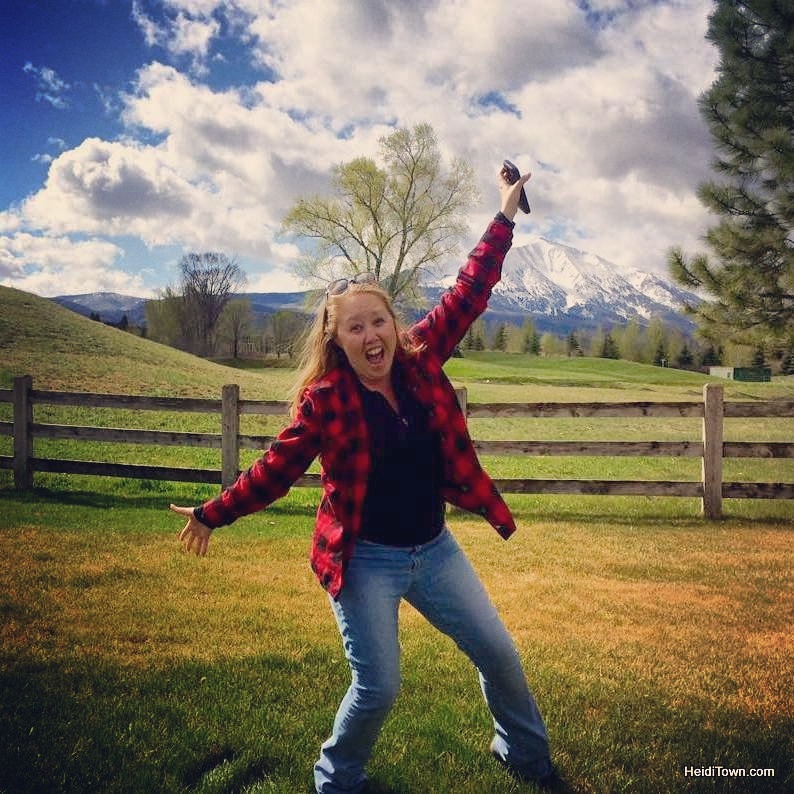 I was beyond excited to win this trip—I was on euphoric. You do not, however, have to be a bird nerd like me to enjoy the crane migration at the Crane Trust. If sunrises inspired you and sunsets leave you entranced, seeing the crane migration should on your must-do travel list. Our entire trip included one night at the Quality Inn in Grand Island and a VIP Crane Viewing Experience at the Crane Trust. We added a third night at the Best Western Plus in Kearney. In this article, I will cover our evening at the Crane Trust. First, you need to understand that sandhill cranes are big birds. They stand three to four feet tall, have a wingspan of six feet and exhibit some fascinating behaviors. 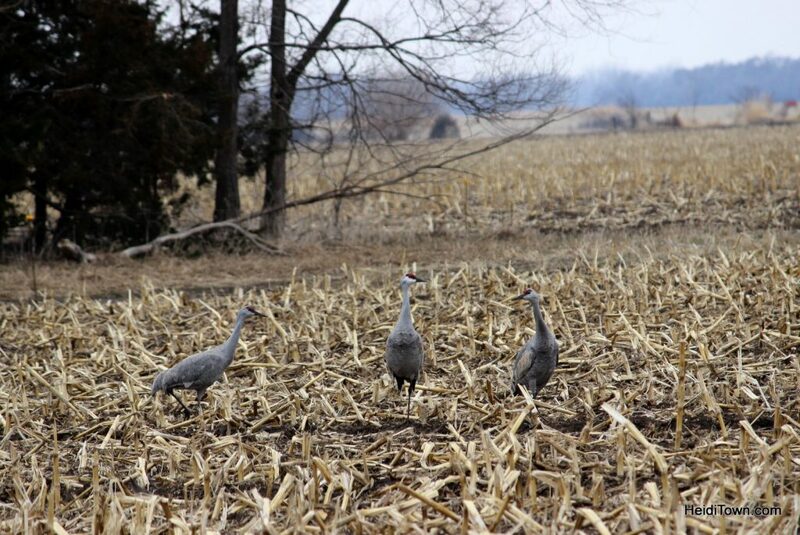 Their tendencies towards dancing and bobbing are on full display during a visit during the crane migration. Ryan and I arrived at the Wild Rose Ranch, the Crane Trust’s property, around 4 p.m. on a Friday. We were staying in the Lauritzen Cottage. There are three cottages on the property as well as a Bunkhouse. Our room featured a full bathroom, two twin beds and an entry area for keeping coats, scopes, binoculars and wet shoes. Our group of about 25, met in the main building for a presentation, a little time exploring the building and surrounding property and dinner. It was a little overcast, but the sky turned a lavender-purple color as the sun settled low in the west. As we waited for dinner, I sipped a Nebraska red wine and listened as the red wing blackbirds trilled around me. The twilight was magical. We enjoyed a chicken dinner and prepared for our excursion. Finishing the last drops of wine in our glasses, we went out onto the patio for the last time before heading out to the blinds. At this point, we could hear the vocalization of the cranes from the nearby river. They were beginning to come in from the fields for the night. When cranes “talk” it’s a unique sound and can be heard from more than two miles away. People who grew up in crane areas, including parts of Colorado, often recall these sounds and associate the purrs and burgles to childhood. Walking out to the blinds. We loaded into two vans and were drove the short distance to where we got out and walked the 200 yards through a soggy field to the blinds. The walk, near sunset, affords views of the prairie, and while crane calls were getting louder, the songs of other birds could be heard too. I have never been in a bird blind before and I probably started with the nicest. The Crane Trust has two blinds in this area overlooking the Platte River. The blinds are large, heated and have seating. There are multiple windows viewers can open and close at their convenience. We set up our scope (borrowed from our friend Sharon) and binoculars at the downriver side of the blind and waited. Already the birds were coming in to pre-roost in the fields across the river. 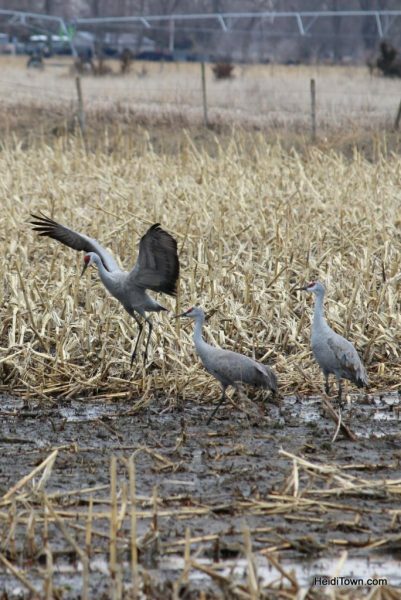 The sandhills cranes spend the day in family groups in the fields around the area, fattening up on all kinds of scrumptious crane treats like grains, berries, earthworms and even mice. In the evening, for safety, they roost en masse on the Platte River, but first, they pre-roost in fields along the river and come to the shallow water once they have deemed it safe to do so. A scope is highly recommended. Dark ribbons of cranes were descending around us. They came in so thick that at a distance they appeared as a dark mass on the horizon. Most of us are used to seeing flocks of geese flying in formation. In my area of Colorado, the geese fly in huge formations of 50 to 100 birds, but this was nothing like geese. The number of cranes in the air was mind-boggling. Finally, a few brave birds landed on the river and this started a trend. More and more birds joined them and as twilight enveloped the river the birds tucked in for the night. We eventually returned to the main building for dessert and then bed, but if we had kept our cottage window open, we would have heard the cranes throughout the night. The next morning, we rose before dawn and returned as quietly as possible to the blinds. A light drizzle fell, and as the day begin to brighten we could see just how many birds were roosting in the river. Their numbers were staggering and as they woke up they danced and bobbed to one another. The morning sunrise was hidden by thick clouds, so the birds didn’t leave en mass. Like humans, a cold misty morning the cranes requires a bit more stretching whereas perhaps I need a second cup of coffee. On a sunny morning, the cranes tend to leave the river together, darkening the sky as they go, but on a drizzly Nebraska morning, they took their time and left in small groups instead of as one. 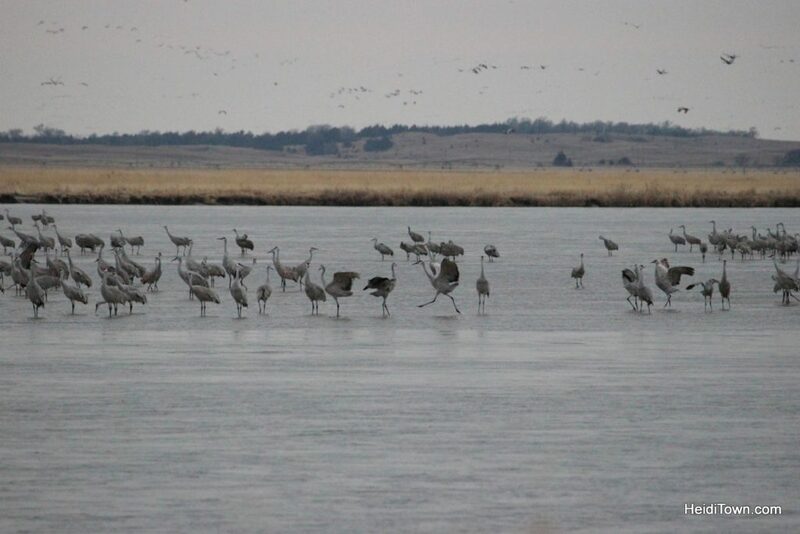 After a couple of hours, it became obvious that many had left as the numbers wading in the shallow water of the Platte River had dwindled significantly, however, the sound of sandhill cranes seemed just as loud. That is what I’ll remember the most from our morning in the Crane Trust VIP blinds; the calls of the cranes was nearly deafening. Apart from the sheer number of birds, it’s like nothing I’ve experienced before. Several of our group, including Ryan and I, walked back that morning instead of hopping in the vans. It was a chilly morning without sunshine, but it had stopped raining and we were exhilarated from crane watching. 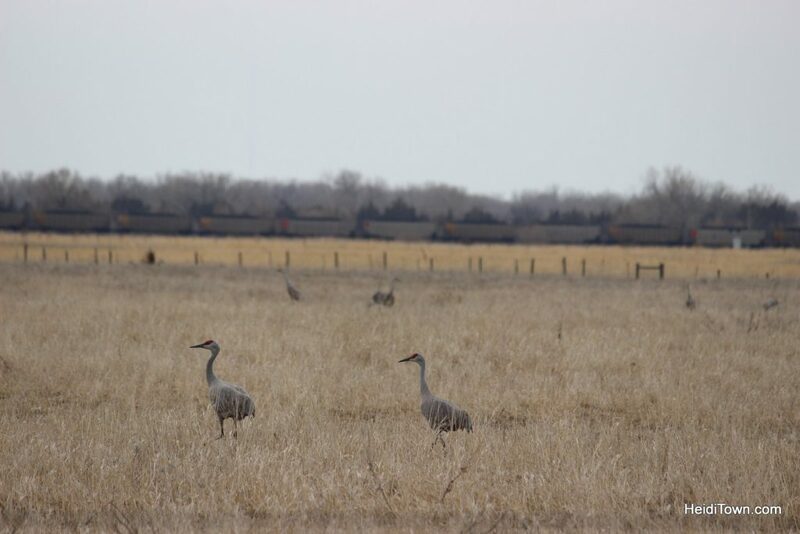 During the day, the sandhill cranes can be found in fields all over the area. We saw them as far west as North Platte, Nebraska. 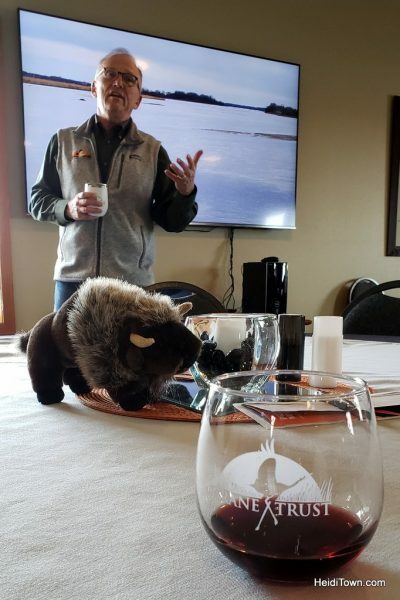 We ate breakfast with the group, delicious breakfast burritos, and listened to a short presentation by Chuck Cooper, president and CEO of the Crane Trust. 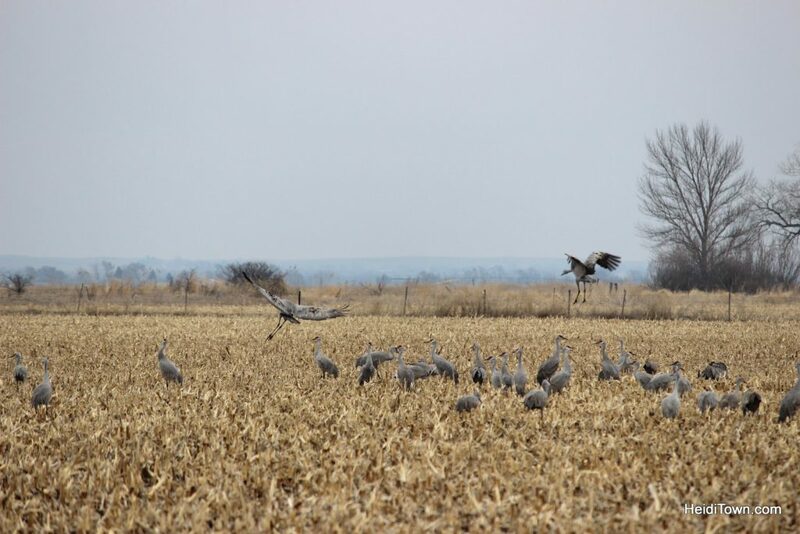 The Crane Trust is an organization formed to preserve tallgrass prairie, it just so happens that the prairie they are preserving is along the banks of the Platte River, and the river is on the migration route of the sandhill cranes. 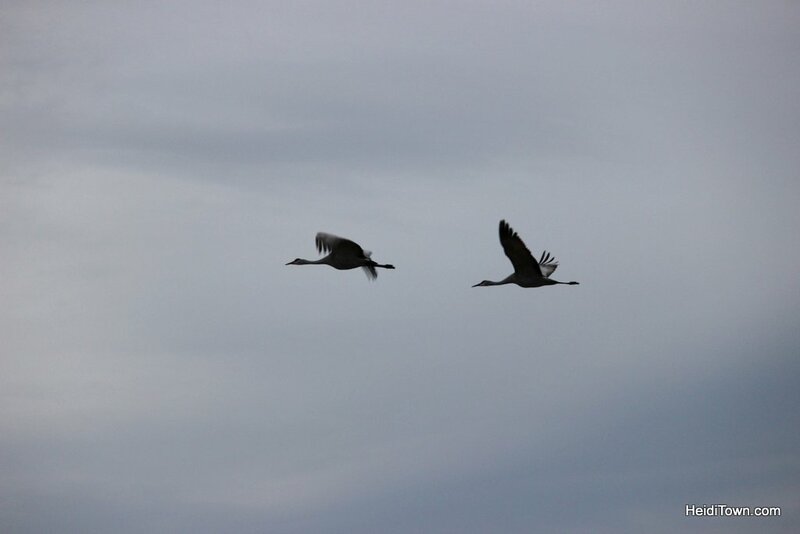 The migration happens sometime between late February and ends around the beginning of April, but for the rest of the year, the team at the Crane Trust focuses on protecting and maintaining the physical, hydrological and biological integrity of the Big Bend area of the Platte River. Tallgass prairies used to cover about 40 percent of the United States and only an estimated one percent or less is left. If the integrity of this tallgrass prairie in Nebraska is not maintained, the crane migration could become a thing of the past, and organizations such as the Crane Trust work to make sure that doesn’t happen. A VIP Crane Watching Experience at the Crane Trust comes with a hands-on staff. Whether it’s at dinner, in the blinds or at breakfast, there are members of the organization there to chat with and ask questions. This is an activity for nature lovers of all ages and it comes with bragging rights. More than 600,000 cranes come through this area, and at last count, on the morning of March 26, there were 659,870 cranes counted. See full report here. To witness this kind of migration is a unique experience that will be cherished forever by those who make it happen. This entire region of Nebraska is filled with colorful American history, great breweries and excellent beef. If you come for the cranes, you’ll discover there’s much more to do in the area. I’ll cover that bit about central Nebraska in upcoming posts. In the meantime, a VIP Crane Watching Experience at the Crane Trust should be on your travel bucket list. Visit the Crane Trust at CraneTrust.org and follow them on Facebook and Twitter. Thank you to my husband Ryan Schlaefer for many of the photos (and the video) in this piece.